United Nations, New York, USA, August 05 2016 – After the Completion of the UN Reconstruction (CMP) the art work are being return to their original places at the UN North Lawn. 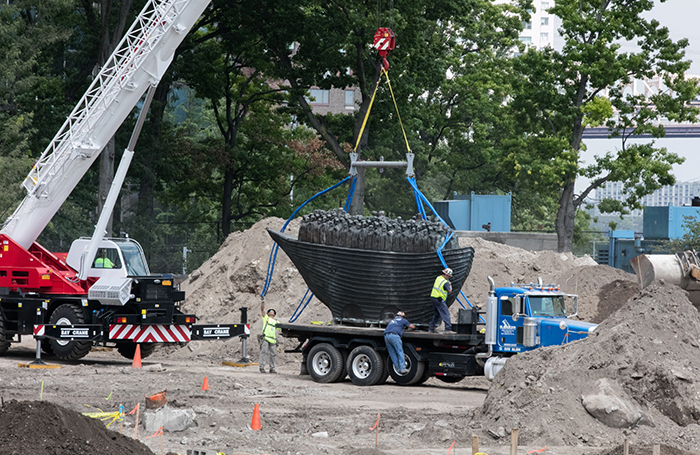 The sculpture Arrival (the Irish ship sculpture) is back to its original location. 8 August: Peace Monument (equestrian sculpture), 10 August: Berlin Wall, 19 August: Mother and Child, 23 August: Victims of Extreme Poverty, 25 August: Roots and Ties. UNITED NATIONS, Aug. 15, 2016 – The renovation of the UN Headquarters under the Capital Master Plan is almost completed. After the temporary North Lawn Building (NLB) had been demolished, the North Lawn is being reconstructed to its original form of 2008. Before the renovation of the UN Headquarters, the North Lawn was home to various sculptures donated to the UN over the years by its member states. When the NLB was constructed on the North Lawn, the sculptures were moved to the rose garden. Now that the Capital Master Plan and with it the reconstruction of the North Lawn is coming to an end, the sculptures will be relocated to their original locations of 2008 within the month of August. “This will be followed by the restoration of a number of the pieces,” Assistant Secretary-General Stephen Cutts, Office of Central Support Services, told Europa Newswire. The first of the statues relocated to their original position in 2008 was “The Arrival”, a bronze ship cast by world-famous Irish artist John Behan. His masterpiece, depicting a Famine era coffin ship, was created in Dublin, before being shipped to New York in August 2000 and positioned at the UN Headquarters the following month. The roughly eight metres high and seven metres long bronze sculpture stands for the contributions made by Irish people to other countries around the world, especially honoring the ones who survived the transatlantic journeys from Ireland to America in the middle of the 19th century. Some 150 figures have been cast on and around the ship, which was relocated to the North Lawn on August 5. After the Completion of the UN Reconstruction (CMP) the art work are being return to their original places at the UN North Lawn. 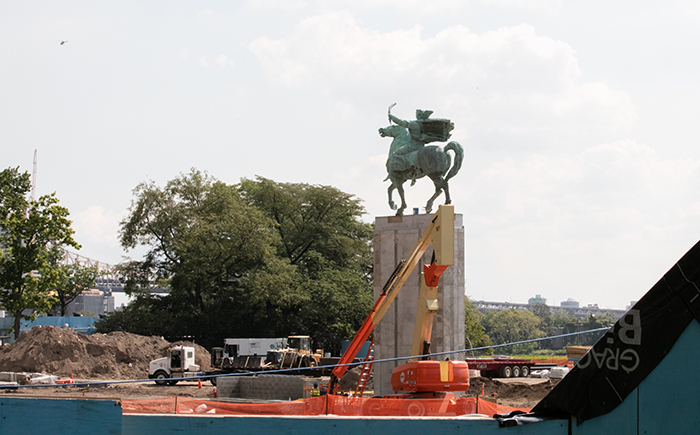 The sculpture Peace Monument (equestrian sculpture), is back to its original location. 8 August: Peace Monument (equestrian sculpture), 10 August: Berlin Wall, 19 August: Mother and Child, 23 August: Victims of Extreme Poverty, 25 August: Roots and Ties. 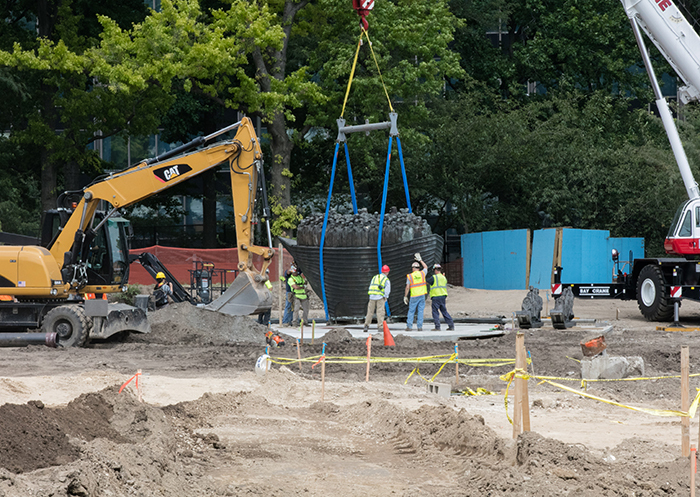 A number of other sculptures has already been relocated or will be relocated this month. The Peace Monument, also known as the Equestrian Statue, was created by Croatian artist Antun Augustincic. The basement of the statue, which was created in the city of Zagreb, is made of Croatian marble and was donated by the former state of Yugoslavia in 1954. The monument was relocated on August 8, followed by the relocation of the Trophy of Civil Rights by artist Kani Alavi on August 10. The Trophy of Civil Rights consists of three segments of the Berlin Wall and was donated to the UN in the year 2002 as a gift from the people of Germany. Iranian-born Alavi participated in the creation of the famous East Side Gallery, a section of the Berlin Wall, painted by artists in 1990. The next relocations will take place later this month, continuing with the Mother and Child statute on August 19. The bronze statue by artists Giacomo Manzu was donated by Italy in 1989. Victims of Extreme Poverty, a statue donated by France and the International Movement ATD Fourth World on the occasion of the International Day for the Eradication of Poverty on 17 October 1996, will be relocated on August 23. The sculpture Roots and Ties for Peace by artist Yolanda d’Augsburg Ulm, which was donated by Brazil in 1983, reflects its surroundings. The stainless steel sculpture is the last of the statues to be relocated on August 25.